R.F. MacDonald Co. services and sells boilers, pumps, composites and accessories for commercial and industrial applications. 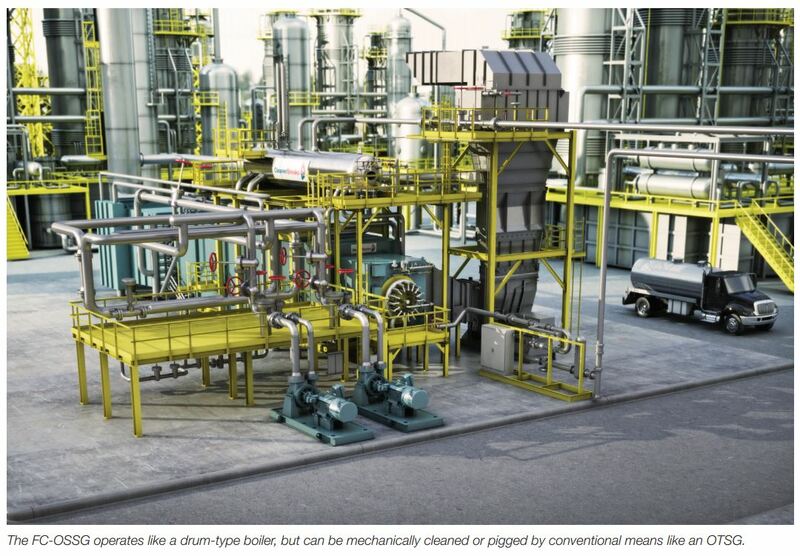 Steam-Assisted Gravity Drainage, better known as SAGD, is considered to be the most viable and environmentally safe recovery technology for extracting heavy oil. The process, which has been utilized for more than a decade, uses an advanced form of steam stimulation to extract oil from a pair of horizontal wells drilled into a reservoir. In the SAGD process, one well is drilled above the bitumen deposit and a second one below the deposit. Bitumen is used to make asphalt. The upper well is supplied with high-pressure steam, and the lower well collects the heated oil or bitumen that flows out, along with any water from the condensation of injected steam. The bitumen and water are pumped out and travel to a tank, where the two elements are separated. This “produced water” is then cleaned and returns to the boiler, where it is converted into steam and injected back into the ground. Fresh water is as precious a resource as oil, so companies opt to utilize groundwater. In the past, a treatment process called warm lime softening was widely accepted to clean oilfield-produced water. When the warm lime softening process is applied, the produced water cannot be cleaned enough for conventional watertube drum boilers, so it has to be processed via a once-through steam generator (OTSG). The OTSG technology, while proven, involves frequent maintenance and cleaning that wastes a lot of water. Environmental regulations are becoming stricter, causing oil companies to focus on water conservation. As a result, a more viable and environmentally friendly technology, called evaporator technology, is replacing the warm lime softening treatment process. Evaporator technology produces higher-quality water compared to warm lime softening. It also conserves water and opens up the steam production options to include the modern industrial watertube/drum boilers. The process takes the clarified water and evaporates it out and then condenses it back to produce feedwater. Companies such as Cleaver-Brooks offer a number of products specifically designed to take advantage of this water treatment process in the field. 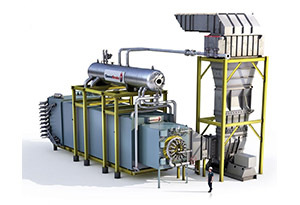 Evaporator water can be run through an OTSG or drum boiler (for medium pressures) as well as through the industry’s newest product, a Forced-Circulation Oil Sands Steam Generator (FC-OSSG) manufactured by Cleaver-Brooks. In an effort to remain on the cutting edge of new product development, Cleaver-Brooks engineers spent seven years meeting with oil producers and engineers in Alberta, Canada to better understand their needs and concerns. 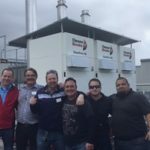 As a result of their meetings, the engineers knew they needed to design a hybrid product that combined the features of a traditional OTSG with the advantages of a drum-type boiler. The result is FC-OSSG, which operates like a drum-type boiler, but can be mechanically cleaned or pigged by conventional means like an OTSG. The issue of water quality upsets is one that is important to oil industry professionals. Existing technologies repeatedly fall short in this area. Even though a system may be operating with evaporated water, which is supposed to be pure, it may still contain oil content above the acceptable limit for drum boilers. This, along with the inevitable water quality upsets, can cause fouling of the heat transfer tubes. Cleaning drum boilers requires access to the inside drums, which are not piggable so tube cleaning can be costly and time-consuming. Alternatively, the OTSG can handle water quality upsets, but the equipment is limited in size. An OTSG only can handle up to 300,000 lb/hr of steam. 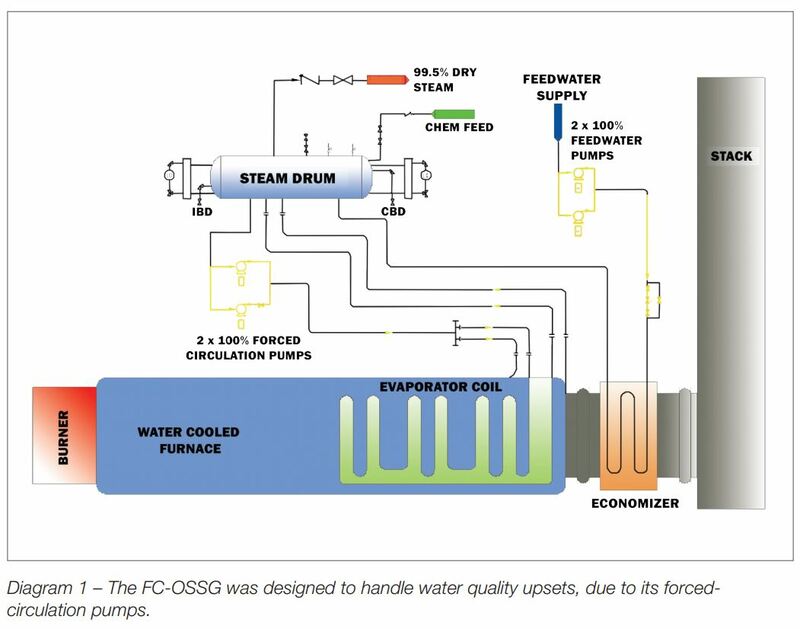 Like any commercial steam generation system, the FC-OSSG starts with an incoming feedwater supply. The water travels through a feedwater pump to the economizer and into the steam drum. (In the OTSG, there is no steam drum.) What is new in this design, compared to a drum boiler or OTSG, is the recirculation pumps. These pumps draw water from the steam drum and push it through the heat transfer circuits (furnace and evaporator). The recirculated water flowing through the heat transfer sections picks up heat and converts the water into steam, which then travels back to the steam drum, where the steam and water are separated. The steam flows out, and the water falls back into the drum. The flow management of the FC-OSSG is depicted above. The water is drawn from the steam drum and is pushed through two independent heat transfer sections (water-cooled membrane walls forming the furnace and evaporator coils). It then comes back to the steam drum, and the steam separates out. The steam goes out, and water drops down and recirculates. One of the advantages of the FC-OSSG over the OTSG is the steam content (steam quality) in the heat-absorbing tubes. The FC-OSSG system pumps 100% water, and by weight 20% converts to steam, which results in a maximum steam content of 20% in the heat-absorbing tubes. The OTSG operates with a maximum steam content of 80% in the heat-absorbing tubes, which means 80% of the water evaporates into steam. Operating with lower steam content (more water content) in the heat-absorbing tubes allows for lower concentration of impurities in the water as well as more predictable metal temperatures. As a result, the rate of failure and frequency of cleaning in an FC-OSSG will be less compared to an OTSG. The FC-OSSG offers multiple options to address water quality upsets. See diagram above. In the first line of defense, which is not proprietary to the FC-OSSG, the conductivity and turbidity of the water coming out of the evaporator are measured. If the water exceeds a certain value, it will be diverted back to the inlet. The second level of defense only applies to FC-OSSG technology. 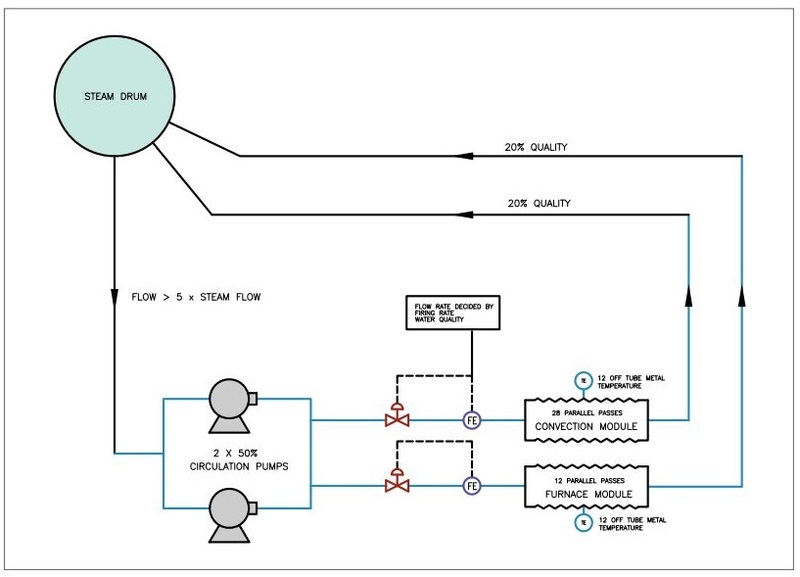 This scenario relates to the boiler feedwater, where the conductivity and turbidity are measured. 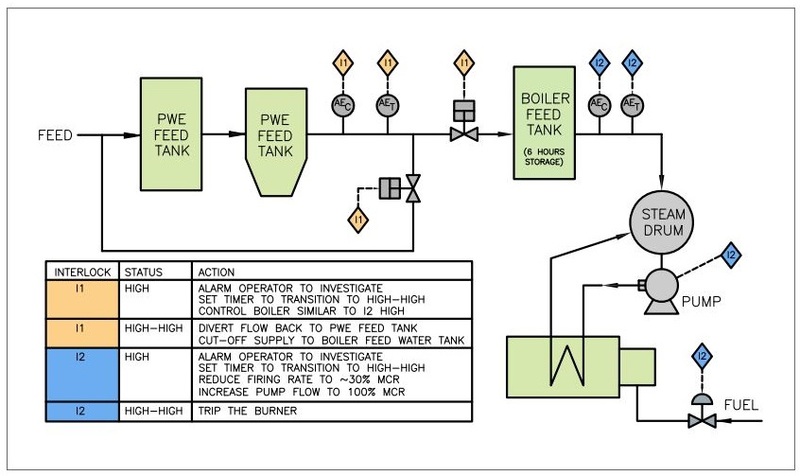 Specific limits are set, and if the feedwater conductivity and turbidity exceed a certain set limit, the control system reduces the firing rate on the boiler and increases the water flow through the tube to protect it. Increasing the amount of water flowing through the tube reduces the steam quality in the heat transfer circuits, resulting in lesser concentration of impurities and reduced metal temperatures. The boiler keeps running but at a reduced firing rate. Then if it exceeds another preset value, the operator trips the boiler to protect it. Unlike in an OTSG, whereby mostly steam travels through the tube, the FC-OSSG is designed so that mostly water flows through the tube. The metal temperature of a water-filled tube closely matches the water temperature rather than the hot gas temperature. For a constant heat flux (rate at which heat is transferred), the tube wall temperature is a function of the steam quality. At lower steam qualities, the tube predominantly is filled with water, and the metal temperature is closer to the water temperature and is stable. As the steam quality increases, the metal temperature also increases, and beyond a certain point it starts dropping down due to the very high velocities in the tube caused by the difference in densities of steam and water. Diagram 4 illustrates this relationship between steam quality and metal temperature. 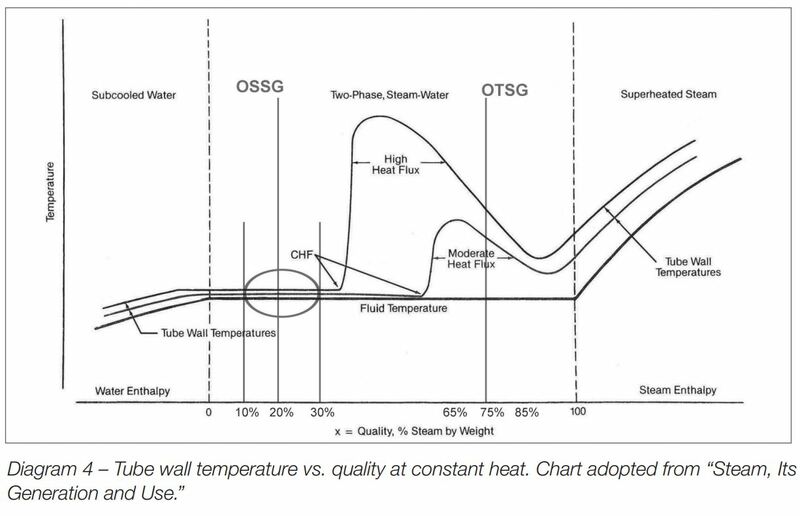 An OTSG operates at 75% to 80% steam quality, to the right of the curve, in the high steam quality region. Trying to predict the metal temperature in this region is very difficult. Conversely, the FC-OSSG operates at 20% steam quality, represented by the flat part of the curve, in the very robust, reliable operating region. Thus, it has much higher tolerance for any heat flux and quality variations during operation. Steam quality and steam output are just a couple of areas where the Cleaver-Brooks FC-OSSG outperforms the OTSG. 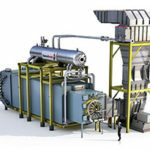 This hybrid system combines the benefits of OTSG and drum-type boilers with regard to steam pressure, blowdown and steam separators purity — among other things. See Table 1. 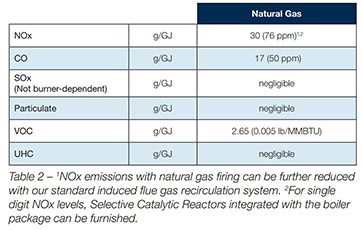 The FC-OSSG has been designed to meet current and future Alberta environmental requirements, including NOx levels below 30 ppm (15.8 g/GJ) while firing natural gas. See Table 2. In developing the FC-OSSG, Cleaver-Brooks engineers followed the same conservative product development template that has worked for the company for decades. Cleaver-Brooks engineers used standard design features from the company’s existing product line, including: forced-circulation circuit designs, water-cooled membrane furnace walls, elevated drum with down-comers and risers to complete the circulation system, modularization to meet Alberta’s market needs and low-emissions burners to meet future limits. Cleaver-Brooks is the only manufacturer in the world that offers a completely integrated boiler, burner and heat recovery system. Because its engineers have the ability to test and refine integrated components, they can align cutting-edge boiler and burner technology in the industry with the latest in advanced controls. 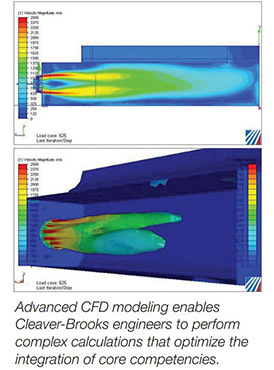 Using state-of-the-art computer programs such as advanced CFD modeling enables the engineers to perform extremely complex calculations that advance design performance and optimize the integration of core competencies. Cleaver-Brooks is a leading provider of engineered boiler systems that is committed to providing efficient solutions to help its customers and the industry reduce energy usage, cost and environmental impact. It has a dedicated alliance of representatives available for consultation, sales, maintenance and aftermarket support. R.F. MacDonald Co. has been in business since 1956. We are a company of 270 employees. We service and sell boilers, pumps, composites and accessories for commercial and industrial applications. Our employees are full-time mechanical engineers, sales engineers, long-time parts salespeople and field service personnel. Allow us to assist you in your equipment selections, installation planning, layout, permitting and project supervision.